1. Direct the merchant to the authentication PayPal URL Facilitates the authentication process. 2. Host a page to which PayPal can automatically redirect the merchant with an authorization code. You will retrieve the permissions from PayPal as an authorization code that is valid for three minutes. After completing the permissions flow, complete a Status Check to make sure the merchant is ready to process PayPal Here transactions. Note: It may be necessary to send the merchant through the business account registration process before they are able to process PayPal Here transactions. Do not store credentials or tokens locally in your apps. Instead, store credentials and tokens in a secure location in your data center. Cache credentials and tokens needed to make API calls in your application. scope The scopes for managing payments and using PayPal Here. Specify all scopes listed in the previous example. Separate scopes with a space. 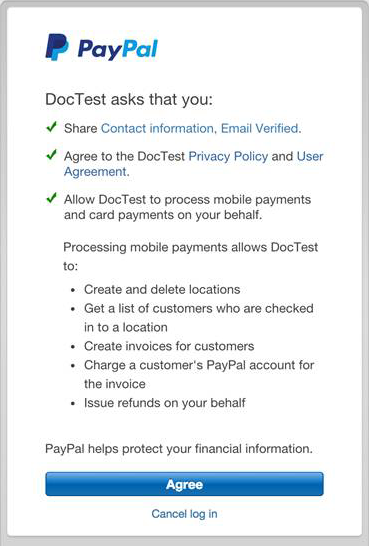 For information about other scopes, see the Connect with PayPal documentation. response_type The response type. Set to code. redirect_uri The URI of the page to which PayPal will redirect the merchant after they have granted you permission to process transactions on their behalf. See the Generating Refresh and Access Codes from the Authorization Code below for a more in-depth explanation. client_id The PayPal-assigned client ID for your app. Be sure to use the client ID for the correct environment (sandbox or live). Note: The redirect_uri domain must match the return URL domain that you provided on the Developer website when you created your REST app, and it must be an SSL-enabled domain; for example, https://example.com. When the merchant clicks Agree, PayPal redirects them to the redirect_uri specified in the steps above. PayPal appends an authorization code to the URL which is valid for only three minutes. In order to handle the token management process, there needs to be an available server. You can use your own server if you have already implemented one, or you could deploy our sample server. The sample server is written in Node.js and can either be deployed to your own Node server or you can use individual modules as you see fit. If you&apos;d like to handle this token management on your own, you can generate an access token from a refresh token and pass that into the SDK directly. Follow the steps above to obtain the proper permissions and generate the authorization code. Remember, this code is only valid for three minutes. Use that authorization code to generate refresh and access tokens. The authorization code, which is returned as code, is valid for only three minutes. You must use this code to generate the refresh token for the merchant’s app. This only needs to be done once, unless the merchant revokes permission. The following call generates an initial access token, which you can use in your requests to the PayPal Here SDK. Authorization request header The Base64-encoded client ID and secret credentials separated by a colon (:). Use the partner&apos;s credentials. grant_type The type of credentials that you provide to obtain a refresh token. Set to authorization_code. code The PayPal-generated authorization code. "token_type": "Bearer" String The token type, which is Bearer. "expires_in": "28800" Integer The number of seconds until the access token expires. Default is 28800. "refresh_token": " Refresh-Token-Value" String The refresh token. "access_token": " Access-Token-Value" String The access token. Important: PayPal Here tokens become inactive if the merchant revokes their third-party permissions from your app through the PayPal website. Stored in a secure, persistent data store on your server and assigned to individual merchants. Used to generate the access tokens required to complete payments and other back-office operations. Maximum length of 1024 characters. Should be used as a runtime variable. Should be stored in a short-term program cache or equivalent. Needs to be refreshed; this can be done just before or any time after expiry. If all of the necessary information is provided into the SDK when initializing the merchant, then the SDK will automatically reach out to your server to initiate the generation of a new access token via the refresh URL that you provide. When you use your own refresh URL without the aid of the sample server, configure it so that it returns the token response directly without any modifications; this way the SDK is able to utilize the necessary information. Authorization request header Contains the Base64-encoded client ID and secret credentials separated by a colon (:). Use the partner&apos;s credentials. grant_type The grant type for obtaining the access token. Set to refresh_token. refresh_token The refresh token for the merchant.